For fast, reliable protection whenever you need it, this boot knife offers excellent concealment and strength in one small package. You will be prepared for almost anything with this menacing AUS8 stainless steel blade. The handle is constructed from injection molded impact resistant TPR with a brass lanyard sleeve. Includes shoulder harness sheath. 5 1/4" blade. 9 1/2" overall. dont throw this! I just broke it. but before that it was my best knife! 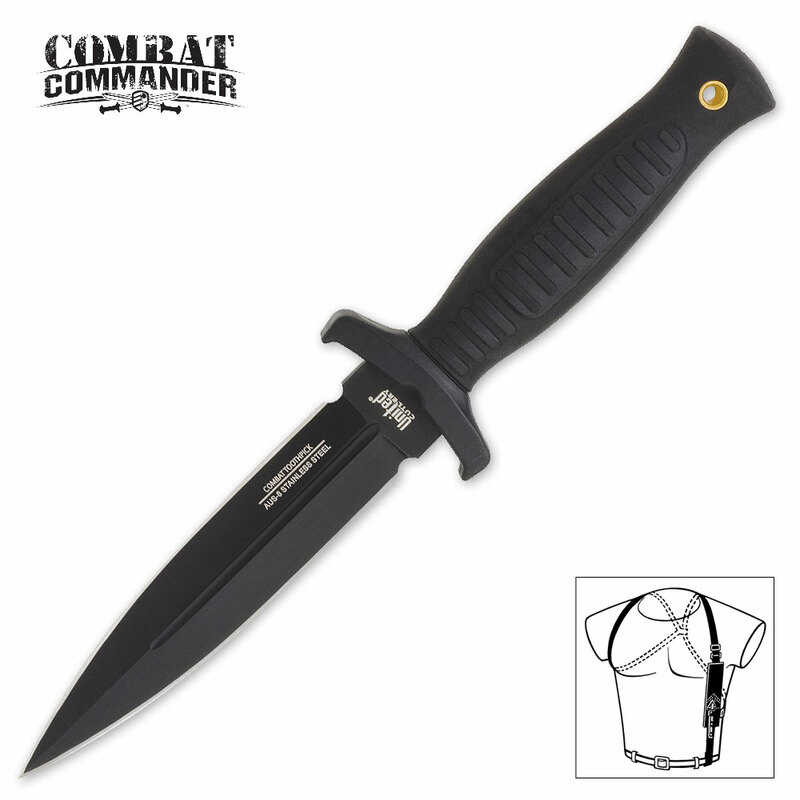 I ordered this knife thinking it would go great with my other united cutlery items that I have purchased in the past. This knife HAD no edge. The sides are almost totally flat (minus the ridge folded over on 1 side) This was the most disappointing knife that I have ever purchased. Sheath is not meant to be clipped to your boot. 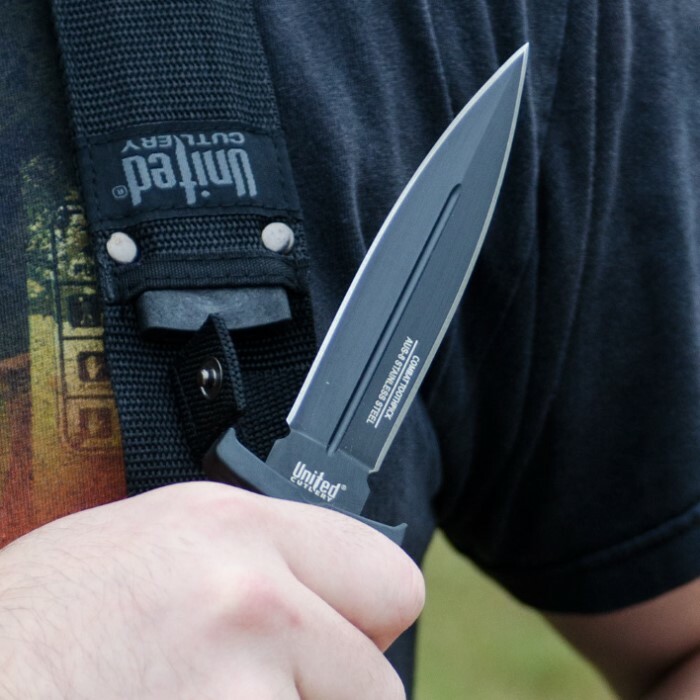 If you want one that will clip to your boot United Cutlery does make this same exact knife with a boot clip sheath instead of shoulder harness. It is just 1-2 bucks more and is sold on this site. The knife itself is great once sharpened, the sheath is meant to be connected in shoulder harness or connected to your belt. The knife has a real loose fit in the sheath so it will easily fall out if not snapped in or if the snap fails. All in all it is a great knife especially for the price and I would recommend it to anyone wanting one. Remember if you want the boot clip instead, het the one for either 14.99 with the chrome finish or 15.99 with the black finish only real difference is look and length of blade varies 1/8 inch. The knife itself it nicely crafted, it may be made in China, but it's extremely high quality. The sheath on the other hand, could use some improvement. The snap on the sheath I received can easily be undone, even the movement from you standing up can undo the snap, which is why I only wear this on my belt, I'm afraid it'll fall from the shoulder sheath and stab me in the foot. But don't let that deter you, other than that, this is an extremely good buy! I purchased this knife for my grandson and I must say it is beautiful. He was thrilled with the gift and I am equally happy. Thank you Bud K, you never disappoint. Very nice knife. I was very impressed when I received it. Very solid and well built. The sheath is ok, but I don't expect it to last very long, the shoulder harness is lousy though. Fortunately the harness part detaches and you can wear it on your belt. As always it came dull, but to be expected with cheap knifes. The blade is nice but the sheath is a real disappointment, it's just cheap and thrown together nylon, I am going to make a better one myself. I think this knife is a great value for the price. although a little uncompfortable when you first put the harness on but you get use to is. the harness itself is not like the picture shows its a single over the shoulder harness. other than that the knife itself was great. it needed a little sharpening at first but after that the knife works great.